According to the U.S. Bureau of Labor Statistics, warehouses experience around 15,000 accidents, illnesses and injuries every year. Safety in the warehouse should be a top priority to protect employees and keep businesses running smoothly. Here are some tips for creating a safe warehouse environment for employees. The first step towards safe practices while working in a warehouse environment is education. Beyond new employee training, hold safety meetings a few times per month to review and highlight various OSHA standards and safe practices. Watch your employees while working and take note of areas that need strengthening, as well as, ask the employees directly about any training they want regarding safety practices. Creating a culture of safety and educating employees properly will go a long way in reducing potential safety hazards. Explain, demonstrate, and encourage various stretches and exercises that employees can do before and after work to minimize aches and pains incurred from continuous standing, bending, lifting, etc. Provide anti-fatigue mats for those employees standing in place all day. Provide back and joint supports for employees that may experience muscle strain from lifting or joint discomfort from repeated movement of knees, elbows, and wrists. Don't forget to monitor any long hair or jewelry/accessories that could get caught in machinery in the warehouse. 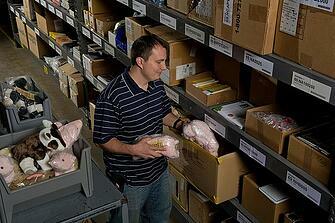 Anticipate and prepare for warehouse safety hazards by maintaining a clean and organized environment. Slips, falls and trips are among the most common incidents leading to warehouse employee injuries. Something as minor as a box out of place or an over-flowing trash can result in an injury for an employee. Keep aisles clear of boxes and other materials to prevent accidents. Make sure any spills are cleaned and clearly marked on floors to avoid slipping. Ensure that guard rails are in place in dock areas to prevent falling. Provide adequate lighting in all areas so employees can easily see any potential hazards. Remember to put heavier items low to the ground and place lighter items higher up. Frequent flyer items with a quick turnaround should be placed towards the middle of the body for easier movement on and off of the shelves. These are just a few safety strategies for creating a safe warehouse environment for employees. Contact us to further discuss safety in the warehouse, distribution, and fulfillment services.